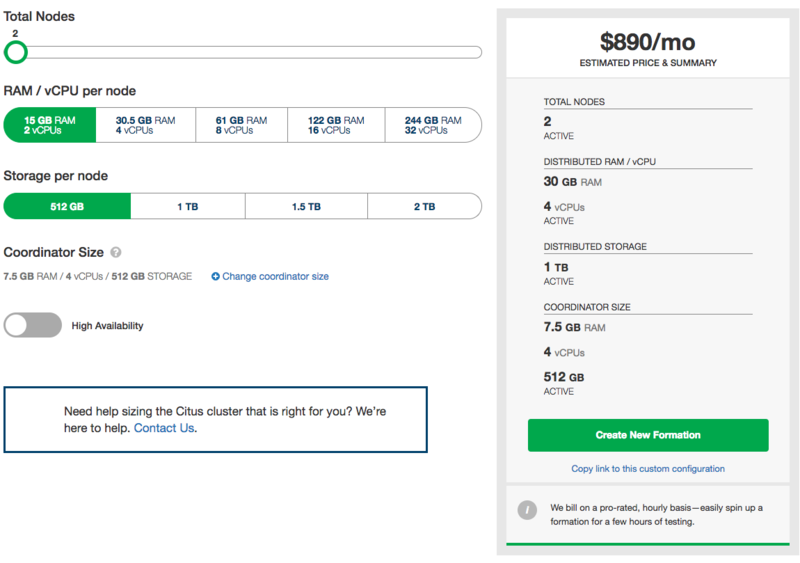 Citus Cloud is a fully managed hosted version of Citus Enterprise edition on top of AWS. Citus Cloud comes with the benefit of Citus allowing you to easily scale out your memory and processing power, without having to worry about keeping it up and running. Once you’ve created your account at https://console.citusdata.com you can provision your Citus cluster. When you login you’ll be at the home of the dashboard, and from here you can click New Formation to begin your formation creation. Citus Cloud plans vary based on the size of your primary node, size of your distributed nodes, number of distributed nodes and whether you have high availability or not. From within the Citus console you can configure your plan or you can preview what it might look like within the pricing calculator. If there is an AWS region you do not see listed but would like for us to add support for please contact us and we’d be happy to look into it. At this time we only support Citus Cloud on top of Amazon Web Services. We are continually exploring other infrastructure providers to make Citus Cloud available on. If you have immediate needs you could consider running Citus Community Edition or Citus Enterprise Edition. Or if you have questions about our timeline for other infrastructure providers please feel free to reach out. The connection string for each Cloud Formation is provided on the Overview tab in Citus Console. By default the URL displays only the hostname of the connection, but the full URL is available by clicking the “Show Full URL” link. Notice how the end of the connection string contains ?sslmode=require. Citus Cloud accepts only SSL connections for security, so this url parameter is required. When connecting from an application framework such as Rails, Django, or Spring you may need to explicitly specify the sslmode as well. The previous section shows how to get a connection string for the coordinator node. To connect a database client such as psql to an individual worker node instead, we’ll need to create new a connection string by replacing the hostname in the coordinator connection string. Replace the host in the coordinator connection string with this value, consulting the previous section for the connection string format. (As shown in the previous section, the hostname to be replaced will be immediately following an @ sign.) Leave all other parameters unchanged. This will be the new connection string for the worker.